Since I'm not completely happy about the fit of my old pair of stays, I've started on a new pair. My first plan was to make them fully hand sewn and use taffeta for the outer layer and stiff linen twill for inner layer with a soft linen fabric for lining. But then I decided that I don't want to make a hand sewn pair until I find a pattern that I know works for me. So the new plan is to make a fully boned pair that have the boning channels machined but all the assembly, lacing holes and bounding of the edges made by hand. 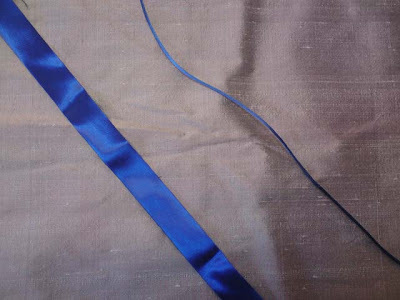 The fabric is a lovely silk dupion from my stash. It's got a subtle sheen that's almost metallic which I think comes from the fact that the warp in it is black and the weft is a very light grey. The bounding ribbon is a synthetic duchess satin tape, I totally fell in love with the color that matches the string I plan to use perfectly. The later is a gift from Isiswardrobe, I think it's made of viscose. 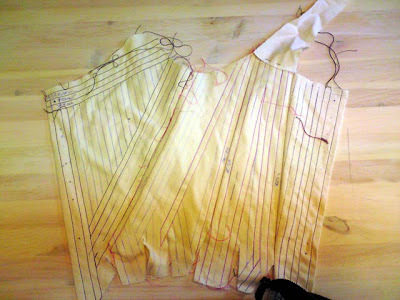 The two inner layers that holds the boning will be made of a stiff linen twill I got in my stash. It's an old bed sheet that I scored on Tradera (the swedish ebay) and it's big enough for several garments. I'll use some leftovers from my chemise for the lining and the hole thing will be boned with synthetic whalebone except for the center front, center back and the horisontal bones, there I'll use flat steel. I got the pattern from Isiswardrobe, we have similar body type but she is bustier than me and have higher waist that me so I had to do a few alterations to the pattern. It was still better than my old pattern because that has a totally too low waist.. The stays will lace up fully in the back and partly in the front. I choose to make them this way so I can get in and out of them myself. If I remember it correctly this pattern is from around the 1780's but I don't remember Isis' source right now.